Which ones are mirrors, and which can we walk through? We're navigating a maze of partitions, some of which have mirrors, others we can walk through. It's trickier than it sounds, as the objects on the ground are designed to align with the reflections so we never know when we're going to walk straight into a pane of glass. Stand in a particular spot and half of an object looks like a rock, the other a piece of rusted metal. It's a perfectly constructed, mind-bending work by Alicja Kwade that looks at the nature of decay and reality. Mirror, mirror on the wall... when will you stop spinning and making us dizzy? 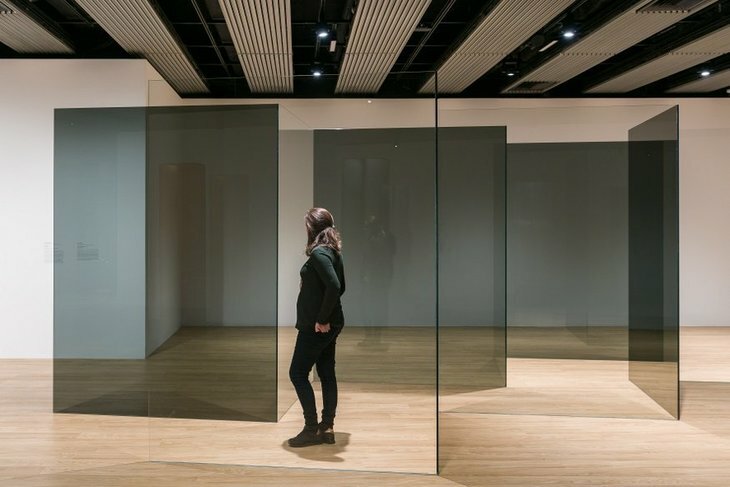 It's a powerful work on its own, but it's part of a spectacular new exhibition at Hayward Gallery, about how we perceive the world around us. A mirror shows our reflection but something's amiss as our two legs have become three and are splaying apart, while another, slower spinning mirror makes us feel dizzy the more we look at it. Yayoi Kusama presents dozens of mini versions of ourselves looking back at us. 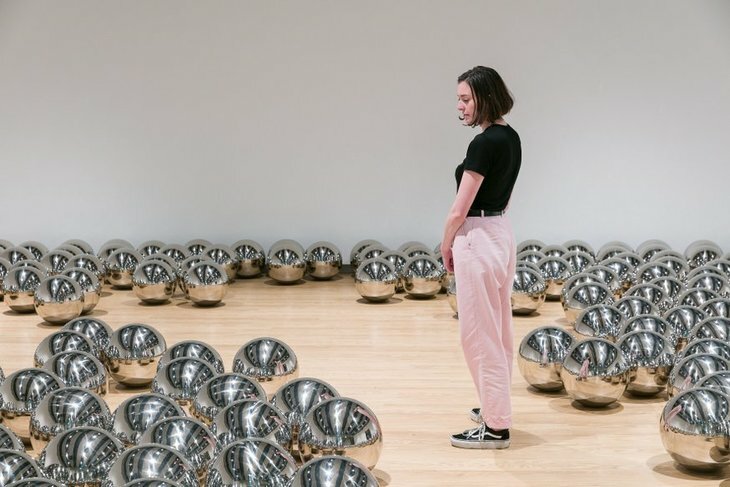 Yayoi Kusama's work surrounds us with dozens of polished metal balls, all feeding back a mini reflection with the effect that we feel like we're being watched by versions of ourselves. What would these hundred-odd versions of ourselves think of the man standing before them? 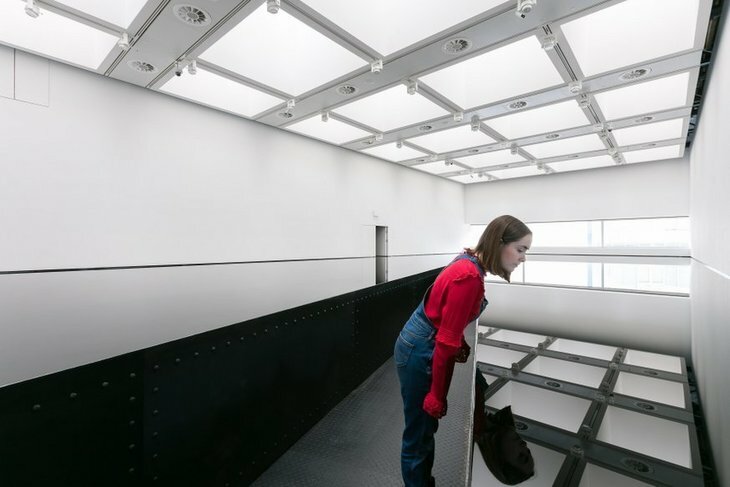 By making this exhibition reflective, both literally and figuratively, visitors are as much a part of this exhibition as the artworks, which lose their potency without an audience. It makes for a greater level of engagement than at other shows. Make sure to avoid the non-tinted glass. It's easy to miss, and a sore nose will be the result. As we take yet another selfie reflected in the coloured cracked safety glass by Veronica Ann Janssens, we flick through our photos of the show so far. Nearly three quarters feature our reflection — have we really become so vain? Is this what Instagram has transformed us into? This show is interactive but it also asks us to pause and reflect on how we view ourselves — through the lens of a smartphone, it seems. Artists have placed chain curtains at different points throughout the show and we find ourselves hesitating as we push through it. 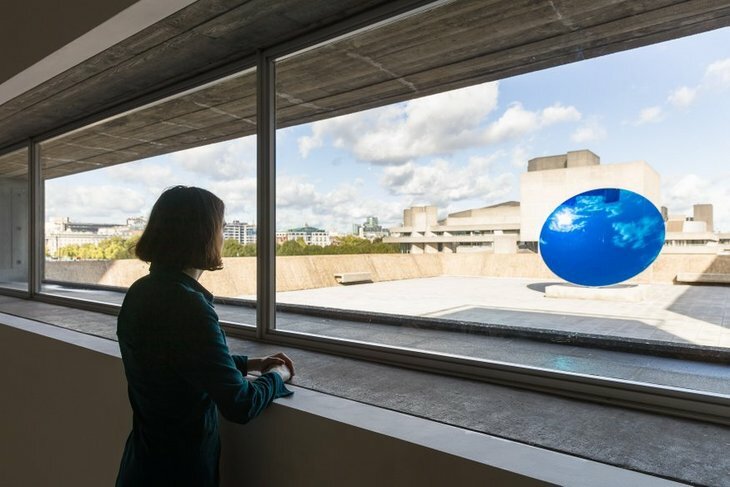 We know the rest of the exhibition lies beyond but it's a pseudo-barrier that disrupts our normal wanderings through an exhibition and makes great use of the Hayward's brutalist space. We question whether we're ready to proceed through and if we've seen everything on this side of the curtain, even though we know we can always come back. Anish Kapoor's works in this show offer a distorted reflection of both ourselves and the sky. This psychoanalysis is parked when we walk up to another breathtaking work, one which we've encountered before. Richard Wilson's massive sump oil work used to live in the basement of Saatchi Gallery, but has been relocated here. A walled path lets us walk right into it and see a perfectly flat surface of oil at waist height reflecting the gallery above us. For the uninitiated it takes a while to realise that what's seen is the ceiling reflected in the oil. Visitors aren't allowed to touch the oil — if they did the fragile illusion would be shattered. We stand at the end and stare into an abyss that will surely consume anything that falls into it, triggering a moment of introspection. Stare into the abyss of sump oil reflecting the ceiling. We could go on about the many fabulous works in this show but we'll leave some for our readers to reflect on when they visit the show. 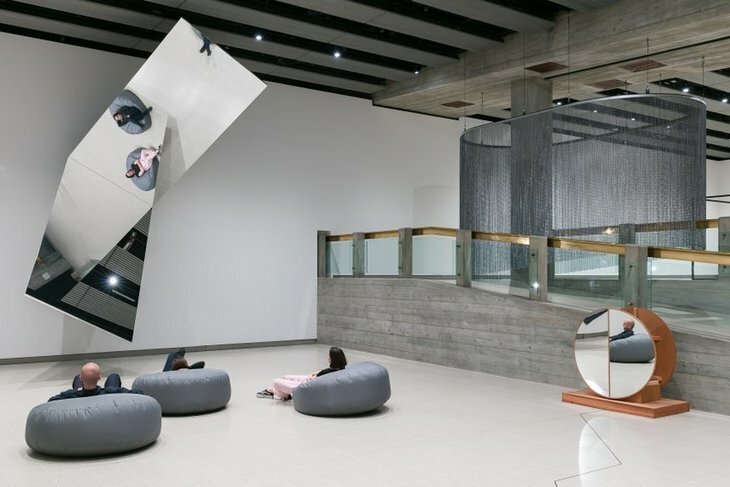 This superb head trip of an exhibition is the best thing Hayward Gallery has shown since Light Show back in 2013, and a front runner for our exhibition of the year. 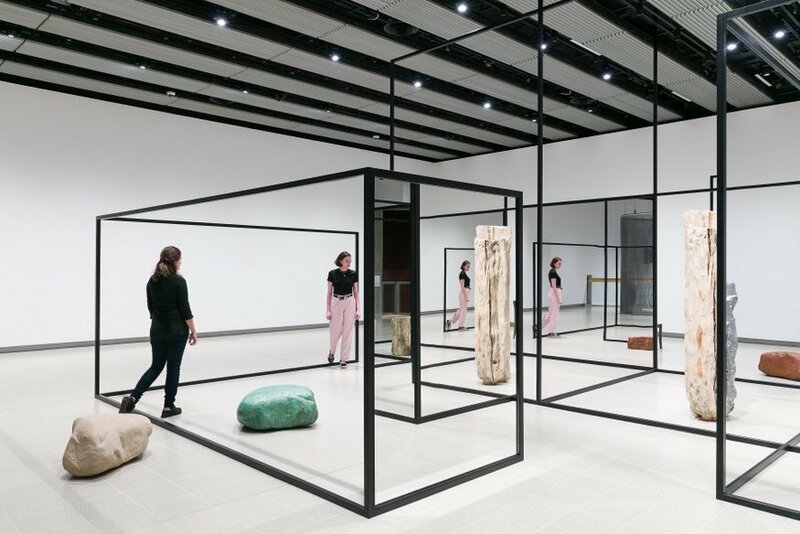 Space Shifters at Hayward Gallery is on until 6 January 2019. Tickets are £16.50 for adults. All images copyright Mark Blower, courtesy Hayward Gallery.